Ambertick™ as a natural tick and flea repellent works in two ways. 1. Aromatic repellent. When the pet wears the stones on his neck, the friction from their fur will absorb the resinous smell coming from the amber. Resinous aromatic terpenes that are released and absorbed in the animal’s fur repel ticks and fleas. 2. Electrostatic repellent. Static electrical charge is generated when Amber is rubbed against the fur. Naturally a cat or a dog does not feel it but every tick or flea that comes in contact with the electrical charged fur gets an electric shock and just falls off. Ambertick™ has perfect amount of amber pieces in the right ratio to function most efficiently despite the pet’s size. We ship Worldwide. The fixed costs are 5.99$ per Package for all International destinations. Orders are dispatched as Registered Priority Airmail every work day except public holidays. Courier services are also available. Please select EMS - Express Mailing Service during the checkout. It costs $59.99 per Package. For DHL shipments please contact us before placing an order. We guarantee to pack and ship all orders within maximum of 24 hours after receiving cleared payment. Currently all orders are dispatched from our storage facility in Lithuania, European Union. All items come inside original Ambertick pack. 1. Use a flexible measuring tape. 3. 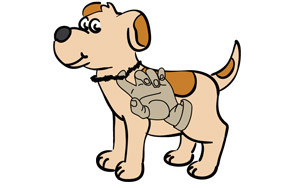 The collar should not strangle your pet, but also doesn’t have to be too loose. NOTE: Ambertick leather fastener adjusts by 5 cm or 2 inches, while some models with a Trigger clip adjusts even by 10 cm or 4 inches. If your pet has a long fur, there’s no need to make the collar visible. It can be hidden under the hair – the friction between the amber and the fur will still do the trick. The items in stock are displayed just under the "Price" field on the right side of the picture. Usually the quantity "In stock" is 1 because we work with natural Baltic amber and its pieces are one of the kind all the time. So even if the design is the same, the end result becomes different. In order to avoid all sorts of issues we have decided to offer most of our products under the rule - what you see in the picture is exactly what you will get.